Pacific Heights San Francisco is a truly beautiful and classic SF neighborhood. It embodies the city you see in the movies with historic and colorful Victorians and mansions. It's also a fun district to go shopping in with locally owned shops as well as internationally recognized high-end brands. 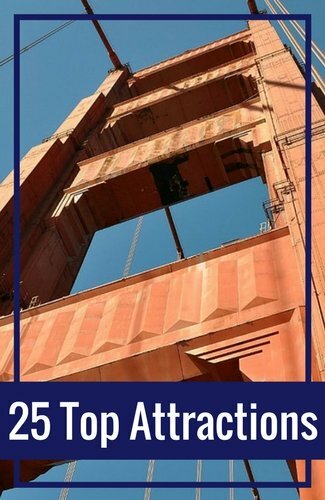 Other fun things to do here include climbing the Lion Street Steps, soaking in the views of the Bay and checking out the outside of the Mrs. Doubtfire house. You can also enjoy its restaurants, bars, and coffee shops. You will find most of the activity in this district centered on or near Fillmore Street. After falling in love with this neighborhood years ago, I made it my home for several years. It is one of the few areas in San Francisco that survived the 1906 earthquake and fire. This is why you can still find old, colorful Victorian homes from the late 1800s. This upscale neighborhood also has gorgeous mansions lining several of its famous streets. Residents of San Francisco first accessed this part of the city after the cable car lines were built in the late 1800s. The steep hills surrounding the district made it tough going, but offered some of the most amazing views of the bay. Once the residents were able to get to the neighborhood, they started to build the fabulous homes that still stand today. With its gorgeous views and beautiful homes, Pacific Heights San Francisco is one of my favorite neighborhoods. I love to explore it as I walk around and see the neighborhood. 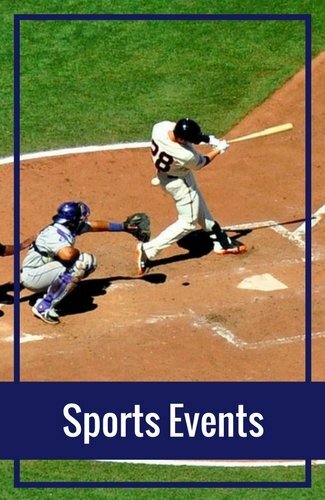 Here are some of my favorite things to see and do. 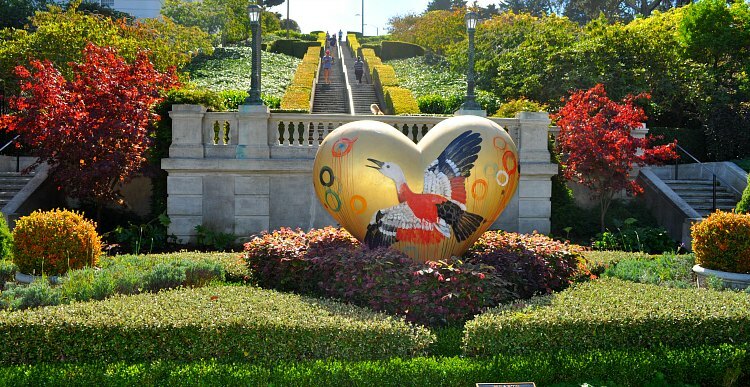 Alta Plaza Park sits at the top of the Pacific Heights San Francisco neighborhood. This gorgeous park is the perfect place to get some of the best views of several nearby districts. This is a popular hangout for the locals and is also surrounded by historic Victorian beauties. I love to grab lunch on Fillmore Street and then come here to eat and enjoy the views. Alta Plaza Park is between Jackson & Clay and Steiner & Scott Streets. One of my favorite places in Pacific Heights San Francisco is the Lyon Street Steps. From this vantage point, the view of the SF Bay is breathtaking. The Lyon Street Steps are a beautifully manicured set of steep stairs that span an entire block. Locals love to come here and run or walk the stairs as they enjoy the views. You'll find the Lyon Street Steps on the corner of Lyon and Broadway streets. Danielle Steel is one of the most famous residents of the Pacific Heights San Francisco neighborhood. She lives in one of the most famous historic mansions - the Spreckles Mansion - on the eastern side of the district. While you can't truly stop by for a visit, you can admire her beautiful mansion from the street. You'll find the Spreckels Mansion on the corner of Washington and Octavia streets - right across from Lafayette Park. Just a few blocks away from Billionaires Row, you'll find three other famous houses. The first one is the Party of Five house located at 2311 Broadway Street. The story line for this show was set in San Francisco, so they used the outside of this house on Broadway to create that vision. Another famous house in this neighborhood is from the TV show Full House. They also used just the outside of the house at 1709 Broderick Street. The story line for this show was also set in San Francisco and each episode featured both this house and the famous Alamo Square neighborhood. Because they used Alamo Square in every show, many people think this house is located there. Instead, it's located in the beautiful Pacific Heights San Francisco neighborhood. The final famous house in this district is the house used in Mrs. Doubtfire. This one is located at 2640 Steiner Street. They also used just the outside and dozens of people stop by everyday for a quick photo. If you want to see even more of the places where movies and TVs were filmed in San Francisco, then you should check out the Half Day Movie Tour. 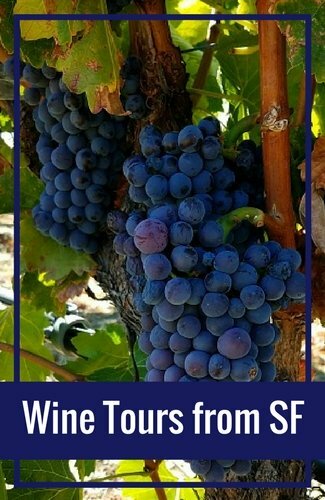 On this tour, your local guide will take you to see where movies such as Mrs. Doubtfire, Basic Instinct, Vertigo and Milk were filmed. In addition, you will also get the chance to see the island where Clint Eastwood said his now famous line "Make my day" in Sudden Impact. It's a fun way to see a different side of San Francisco. 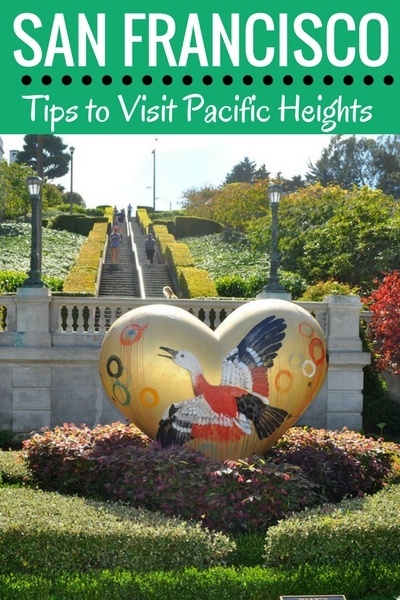 City Tour: One of the best ways to see Pacific Heights San Francisco as well as many other top districts is to spend some time on this City Tour. 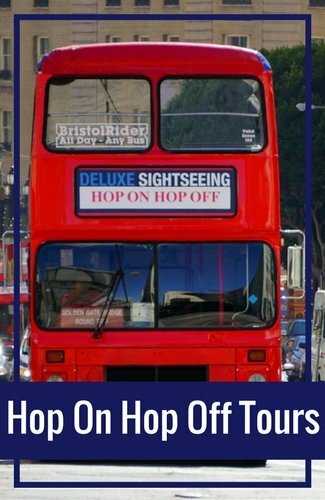 This 3-hour tour will take you past top attractions and districts. It runs most days of the year. 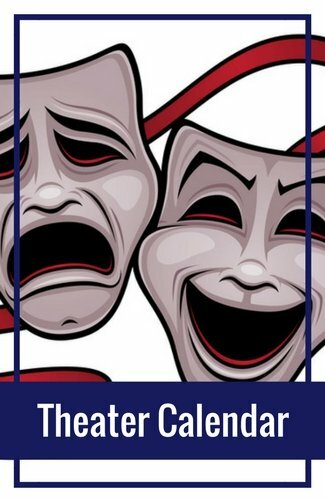 Find ticket availability here. Pacific Heights San Francisco is also home to some of the most expensive houses in the world. They are so large and pricey that a two block stretch of the neighborhood is dubbed Billionaires Row. You will find this area along Broadway Street between Broderick and Lyon streets (it ends at the Lyon Street Steps). You can either stroll along the street on your own or take a free San Francisco Public Library walking tour where you can learn the history and the story behind some of these mansions. The Fillmore Jazz Festival is one of the best summer festivals in San Francisco. This festival is held on Fillmore Street near the Pacific Heights and Japantown neighborhoods in San Francisco. The festival features several stages with live jazz performances. You can also find dozens of food vendors and artists selling their hand crafted items. This festival is always held on or around the July 4th holiday. The Haas-Lilienthal House is a historic beauty that was completed in 1886. It's a Queen Anne-style Victorian house. 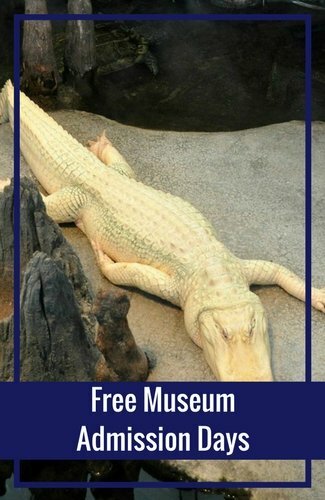 It's the only private home from that time period that is open to the public. When you visit this house, you'll get the chance to see authentic furniture, the circular corner tower, and photographs describing this home's history. You will find some discounts around SF on Goldstar. It's a great place to save up to 50% off on your cruises, tours, and select events. Here are just some of the most popular current discounts available. You will also find a handful of boutique Pacific Heights San Francisco hotels. Here's a quick overview of some of my top picks. Hotel Drisco is one of the highest rated hotels in San Francisco. This four-star beauty is set among the gorgeous Victorians and mansions in the Pacific Heights neighborhood. Guests rave about this historic and elegant lodging option. It's also in a quiet and serene neighborhood - away from the chaos of the city. At the Hotel Drisco, you get breakfast, parking, and high-speed Internet. A business center, fitness center and room service are also available. In addition to these amenities, you can also request a suite. Discover recent guest reviews and compare prices for the Hotel Drisco on TripAdvisor. The Jackson Court is a small, two and a half star hotel on the eastern side of Pacific Heights. It's set in an historic brownstone mansion built in 1900 with a beautiful flower lined courtyard. Guests consider this hotel elegant and serene. Each of its 10 guest rooms are uniquely decorated and offer both antique and modern furnishings. At the Jackson Court, you will receive free breakfast and can access free Wi-Fi throughout the hotel. In addition, you will also find a well-equipped business center and a game room. Read recent guest reviews and find the best price for the Jackson Court San Francisco. Discover recommendations for some of the best hotels in other neighborhoods in San Francisco. You can also find the top hotels by budget and based on certain amenities. This is one of the neighborhoods in San Francisco that is not really known for their food. However, there are some good options here if you look around a little. Here are just a few of my favorites. 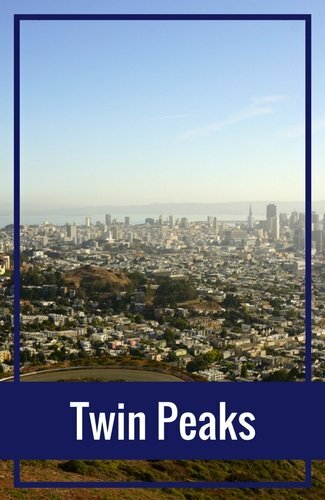 Pacific Heights San Francisco is one of the neighborhoods that's easy to get to by public transit. There is also plenty of parking on the western side of the neighborhood, so driving is another good option. 3 Jackson: The 3 Jackson bus has several stops just a few blocks from Union Square. You can pick it up along Sutter Street and take it all the way to Pacific Heights. The 3 Jackson turns onto Fillmore Street where you can get close to all of the attractions, restaurants, and bars in this neighborhood. You can exit at any of the Fillmore Street stops. No bus runs directly from Fisherman's Wharf to Pacific Heights San Francisco, but there a couple of easy ways to get here with just one transfer. 30 Stockton + 22 Fillmore: Your best option is to hop on the 30 Stockton at the Hyde and North Point stop. Take it to the Fillmore Street stop in the Marina district. From here, you'll cross the street and pick up the 22 Fillmore. This bus will take you all the way up the hill to the Pacific Heights neighborhood. 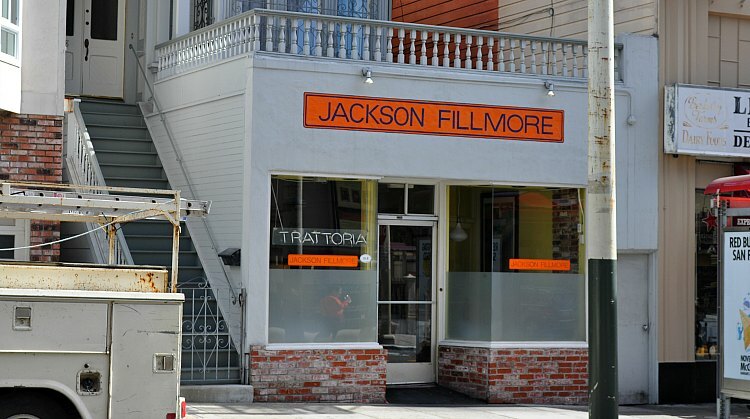 You can get off at any of the Fillmore Street stops after Jackson Street.